In my last Chinese tea post I described six main categories of Chinese tea. In this post I am going to introduce you to more tea categories, some of which don’t actually contain tea. These are teas infused with, or made of, ingredients other than Camellia Sinensis leaves. Scented teas are made by infusing tea leaves with an extra flavour, usually from a flower or fruit, sometimes other flavours such as ginseng. The two most common scented teas (Jasmine and Osmanthus) are made by spreading dried flowers over the leaves while they are being processed, usually during oxidisation. Sometimes flowers are left in the finished tea for decoration. Another common scented tea uses lychee fruit in a similar fashion. Scented teas vary in quality according to the quality of tea leaves used. Lower quality teas are often made of chopped leaves, whereas higher quality teas have whole leaves that have been carefully shaped or rolled. Both green and oolong teas are used to make scented Chinese teas, and there many scented red teas available in the west. Really cheap versions of scented teas also exist which are artificially flavoured. Good quality rolled Jasmine tea – dry leaves, steeped 10 minutes, steeped 20 mintues, and the leaves after steeping. I haven’t tried a smoked tea yet. The tea leaves are infused with a smoky flavour by exposing the leaves to burning wood while they are processed. The amount of smoke used varies, creating a range of more and less smoked teas. A famous example is Lapsang souchong, one of the earliest red teas produced in China, which is placed in bamboo baskets and smoked with pine wood. Flower teas aren’t made with tea at all – they are whole, dried flowers which are steeped like a tea would be. Many different flowers are made into teas; the most common are chrysanthemum and rose, but other flowers used include clover, honeysuckle, hibiscus, and apple. 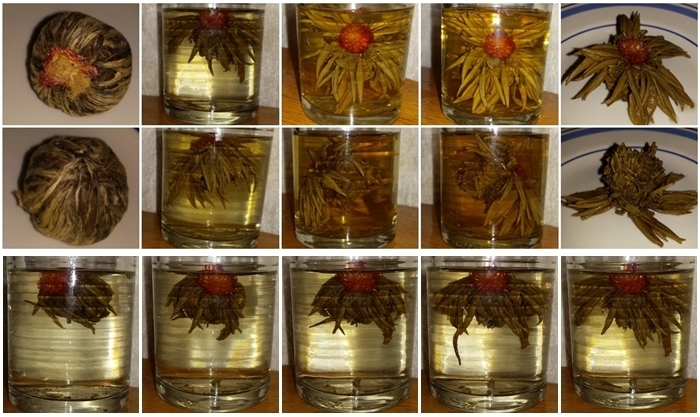 I was introduced to Chrsyanthemum tea soon after moving to China in 2004 – probably in my first week. Steeped, it gives a bright yellow green colour and is usually drunk with rock sugar (sometimes with goji berries). It’s not a great favourite of mine (I find the flavour too strong) but one tea shop owner had me try a mixed blend of chrysanthemum and rose – it was really lovely. Another suggested combining Rose tea with Pu’er (black) tea – it sounded strange but tasted wonderful. Roses need to steep longer than tea leaves to get the best flavour (about 20 minutes) which makes it perfect for sitting around all afternoon. Rose and Chrysanthemum teas – dry flowers, steeped 10 minutes, steeped 20 minutes, from above, and the flowers after steeping. A blooming tea opening. Front and side/back views: dry, steeped 5, 10 and 20 mins, and after steeping. Bottom row: the tea unfurling over 5 minutes. Herbal teas are any other steeped concoction made of plants other than tea leaves and flowers. What Chinese call “herbal tea” generally means a medicinal brew, but there are other non-tea teas. (If you are interested in Chinese medicinal teas and ingredients, this website has a good introduction.) One interesting example of a tealess-tea is “Snow Tea” – a high elevation “tea” that is actually made of a type of lichen. Jiaogulan (绞股蓝 jiǎo gǔ lán) is a climbing vine plant popular as a herbal tea. Kuding tea (苦丁茶 kǔ dīng chá) is a bitter herbal tea made from a holly-like plant. One common tea I had trouble categorising is ba bao cha “eight treasure tea”. It is usually served in individual cups, each cup with its own set of ingredients. There are many variations. There are nine usual ingredients (sometimes there are more than eight ingredients in eight-treasure tea, sometimes different ingredients are skipped). Those nine ingredients are: green tea, chrysanthemum, ginseng, red date, longan, goji berry, lotus seed, tangerine peel, and rock sugar. Some other common alternative (or additions) are honeysuckle, rose, sesame, and haw berry. All the ingredients are used in their dried form. The dried fruits and flowers rehydrate as the tea steeps, so it becomes quite pretty.